The Tracer LED sport light is a rechargeable cordless design The lithium battery has been built into the handle providing a cordless light, it is lightweight and ultra portable. The Predator Fox Hunter is a 150mm handheld LED lamp, It has a longlife LED bulb which produces a super bright, long distance beam / 500 mtr max. 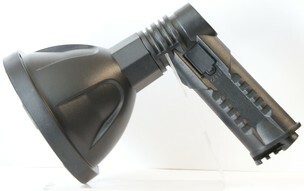 The high performance built in rechargeable battery gives upto 2.5 hours of light when needed. 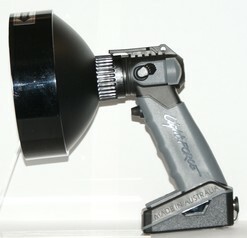 The LED lamp is light weight, has strong power and is durable with an ergonomic design to fit securely in your hand. 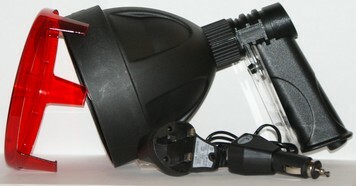 The LED lamp is supplied with a mains charger and car charger. The dual colour Enforcer LED 140 is lightweight and compact, It has an internal battery proviving four hours at full power, followed by one hour in power saving mode. You can flick between white & red beam at the flick of a switch, no need to add a coloured filter ~ It's all inbuilt. The Enforcer LED is one of the most flexible & portable products in the Lightforce handheld range, An ergonomic grip and in built battery indicator combine to make the Enforcer LED the ultimate accessory.